One book at a time has never been my style. 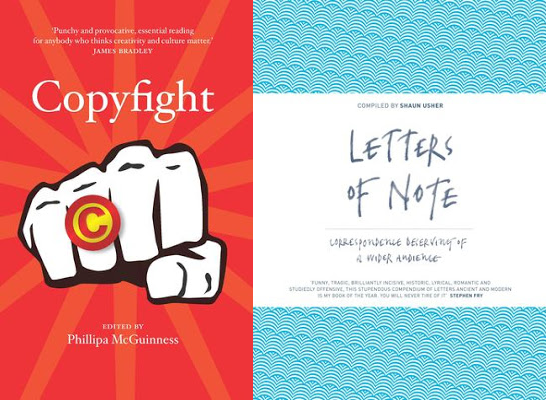 I feel as if it should be, that it'd be good for focus and so on, but recently I had the good fortune to be reading Letters of note and Copyfight whilst the #cooking forcopyright campaign was in full swing. They complimented each other beautifully. A quick aside, as I'm discussing matters of law here, I want to point out that I have not studied law and am not a copyright subject expert. Except where stated, opinions here are my own, derived from earlier experiences, reading Copyfight and materials connected to the Cooking for Copyright campaign. Letters of Note is a collection of correspondence compiled by Shaun Usher, based on the blog of the same name. It's a wonderful book full of insights to popular and historically significant people and times, giving them the human touch a brief encyclopedic article can't. Among my many favourites are the letter from 11-year-old girl who wrote to Abraham Lincoln to suggest that he grow a beard, Tim Schafer's text adventure covering letter to a job application and Kurt Vonnegut's letter to the head of a school board that consigned a class set of his books to their furnace. The letters can be beautiful, funny, shocking and emotional. Presenting primary sources with brief explanations and transcriptions or translations as needed is powerful. It also contains a double page of tiny type with acknowledgements, permissions and copyright statements, a fact I'll return to later. I will also come back to the wonderful Australian inclusion, To a Top Scientist which can also be found on the Letters of Note blog. As I write this a second volume is currently available for pre-order and I am keen to discover what it contains. 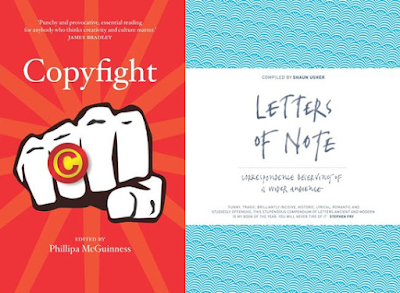 Copyfight, edited by Phillipa McGuinness, is a collection of various discussions and arguments around Australian copyright as it stands in mid-2015, a far more interesting and convoluted topic than might be expected. It doesn't look good for copyright now - and I'm unconvinced copyright in Australia has a "good old days". Copyright is perpetually lagging behind developments in technology and culture. The possibilities brought on by the Internet are among the latest of many rounds, once it was music recordings in wax that caused a shake-up. Unsurprisingly, quite a few of the articles in Copyfight focus on the elephant in the room, copyright owners vs. piracy, which I have no intention of discussing here. Many avoid that headline-grabbing political football of a topic and look at other issues. These make it clear that copyright reform is needed for many reasons beyond the aforementioned elephant. Copyright should encourage creation and balance the interests of creators, investors, consumers (individually) and the general public. I'm not convinced it does that nearly as well as it should. A number of problems stood out as I read Copyfight. One was lack of fair use provisions, fair dealing does not cut it and probably never did. Several articles in this book explain some of the reasons for this, especially those by Angela Bowne and Dan Ilic. It's likely I've technically breached this many times without doing anything the reasonable person would consider unfair, I might even have done it in this post. There's another problem in copyright length - while authors and investors need the right to profit from their work, I see the extension from 50 to 70 years after death of the creator as stinking of protection of multinational corporate interests that are disconnected from original creators and encouragement of new creative works. Justin Heazlewood and Lindy Morrison show that performers' copyright offers poor protection to individual artists and smaller copyright owners, especially when crossing national borders. Felicity Fenner shows that copyright for visual arts is ambiguous and inadequate. The public inaccessibility of data and reports from publicly funded research in publicly funded institutions is another issue that is explained in detail by Hannah Forsyth. This is just a sampling of the issues. Copyfight unearths some of the complications reforms must deal with - our laws exist in an international environment which is affected by treaties, trade agreements and international relations in a world where not all sizeable markets apply the principles of the Berne Convention. Any such reforms would then have to survive meeting the courts. It's the copyright status of unpublished works that draws this all together. Tim Sherratt's article in Copyfight explores some of the ways that TROVE has been used to explore and understand Australia's cultural heritage through digitisation of newspapers and magazines and the impact this has had - and why most of it stops in 1954 and how even that is in risky copyright territory. Alongside these newspapers, Australian libraries and archives contain a wealth of unpublished resources - letters, photographs, diaries and more that could expand our cultural understanding if made available digitally. The Australian National Library alone contains over two million unpublished works (source, p. 50). At present, under Australian law the copyright on unpublished works never expires. ALIA's FAIR initiative provides an explanation, references and resources. Ownership of this never-ending copyright may be unclear or spectacularly difficult to determine - and there is no exception for orphan works. The holding institution may have some ability to use them, but it is unclear as to whether mass digitisation is covered (source). Once I found several old annotated photographs in a donation to a library I was working in. The donor did not want them returned or destroyed, and the photographs, while insightful, were not of local relevance. As an alternative, I looked into donating them to the local or state library whose collection parameters they fit. The state library was interested, but wanted a donation form filled out which, amongst other things, requested that I assign copyright to them - it was not mine to give. There is no way to know whose copyright it was as the donor was not the photographer and the items did not give clues. Consequently, if the receiving library chose to keep those items their usefulness would be severely limited. The pages acknowledging sources and copyright in Letters of Note may be sufficient for that publication, but determining and finding the copyright owners of works in Australian collections would be a greater barrier. Taking the risk that TROVE has in releasing material of uncertain copyright status might not be acceptable to a smaller institution, commercial publisher or private individual. Where copyright owners are living, such as To a Top Scientist in Letters of Note, permission might be reasonably achievable. Some copyright owners would be easy to trace. Many would not, an example given by FAIR is of a letter and recipe sent to a radio presenter where there is a theory as to the author's identity, but no certainty. So whilst I found the reading of Letters of Note enlightening and wondered what an Australian version of this might teach, I am not likely to find out while our copyright laws remain as they are. Bring on the change. Thank you, Heather, for these thoughts about copyright. The letter from Denis Cox "To a Top Scientist" which you have seen in the Letter Of Note book makes an interesting study. One day back in 2009 I saw the feature on the National Archives of Australia's Find Of The Month ( http://www.naa.gov.au/collection/snapshots/find-of-the-month/2009-may.aspx ) and thought that I would like to write a little story about it. I knew that my story would be much stronger and more interesting if I could get in touch with Denis Cox for some quotes looking back on his 1957-self. I looked at the NAA's website copyright statement (which has now been changed somewhat since then) and decided that I should seek copyright permission from the NAA before republishing the letter on my blogsite. The word came back to me from the NAA that they were not the copyright owners and therefore could not grant permission to me, but that the original 1957 childhood author Denis Cox was the copyright owner and should be sought out for permission. They did not explain the paradox that they themselves had seen fit to publish it without his permission, but who am I to quibble? With some tracing (Google knows all), I was eventually able to make contact with Mr. Cox who kindly granted his permission to me to publish his long-forgotten work. He had no idea whatsoever that the NAA had published his letter and was frankly astonished that it still existed. Shaun Usher eventually published the letter on his blog in September 2009 (without copyright permission) and I now that Denis Cox was not in the least perturbed by that. In 2012, when he was compiling the book you have in your hand, Shaun Usher emailed me asking for Denis Cox's contact details so that he could seek copyright permission. I believe Denis Cox was again happy to grant publication permission. "As far as practicable, material for which the copyright is owned by a third party will be clearly labelled. The National Archives has made all reasonable efforts to ensure that this material has been reproduced on this website with the full consent of the copyright owners." As far as I am aware the NAA never sought Denis Cox's permission, even retrospectively, to publish his letter nor are they aware that a nice little piece of publicity was lost to them. On the other hand, it's worth noting that the images of Denis Cox's letter which I published on my blog and which Shaun Usher used his book were actually images created by the NAA's image scanning process. I took it that they had implied to me that I could use them when they told me to seek permission from the original author.